One of Professor Redish’s many important contributions to legal scholarship is his recent work on class actions. Grounding his argument in the theory of democratic accountability that has been at the centerpiece of all his work, Professor Redish suggests that, in nearly all instances, class actions violate the individual autonomy of litigants and should not be used by courts. This Essay, prepared for a festschrift in honor of Professor Redish, begins from the opposite premise: that class actions should be grounded in the notion of social utility rather than autonomy so that class actions should be used whenever they achieve net social gains. 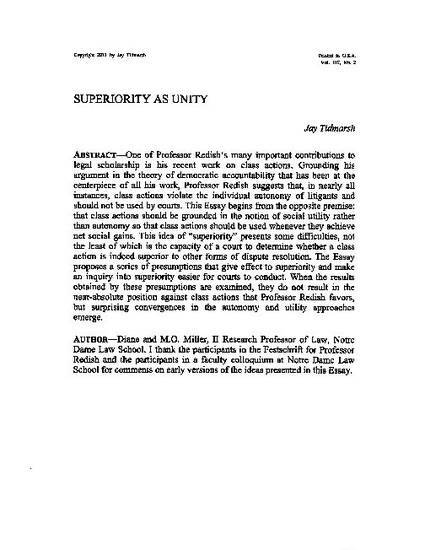 This idea of “superiority” presents some difficulties, not the least of which is the capacity of a court to determine whether a class action is indeed superior to other forms of dispute resolution. The Essay proposes a series of presumptions that give effect to superiority and make an inquiry into superiority easier for courts to conduct. When the class-certification outcomes obtained by these presumptions are examined, they do not result in the near-absolute position against class actions that Professor Redish favors, but surprising convergences in the autonomy and utility approaches emerge.